Lincoln Fowler’s Century-Old Home. Photo by Michael Horne. Nothing better exemplifies the “be a tourist in your own hometown” movement quite like the annual ritual of the Garden Tour. Homeowners open their grounds to the scrutiny of visitors, and there can be a great deal of note-taking on site by those eager to adapt (or avoid) the plantings of their hosts. 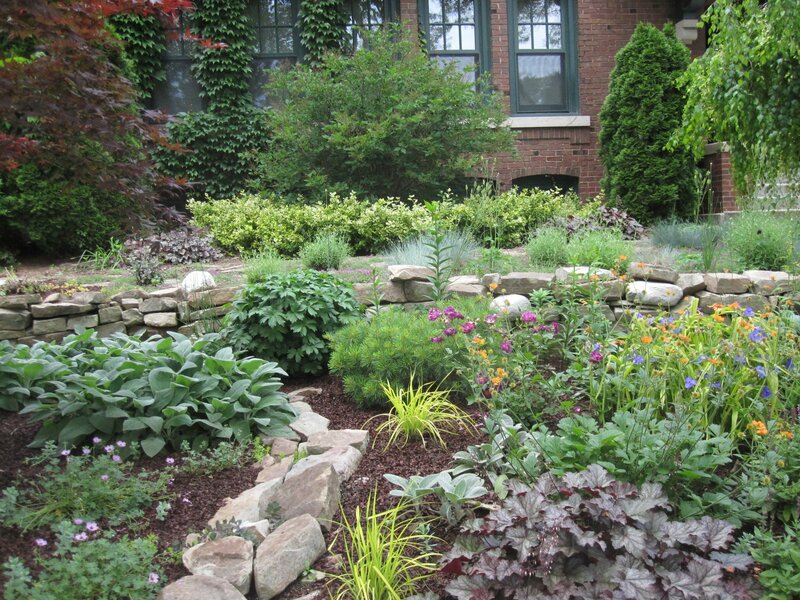 Sunday, June 25th will be the 5th Annual East Side Milwaukee Garden Tour, organized by the Eastside Milwaukee Community Council. 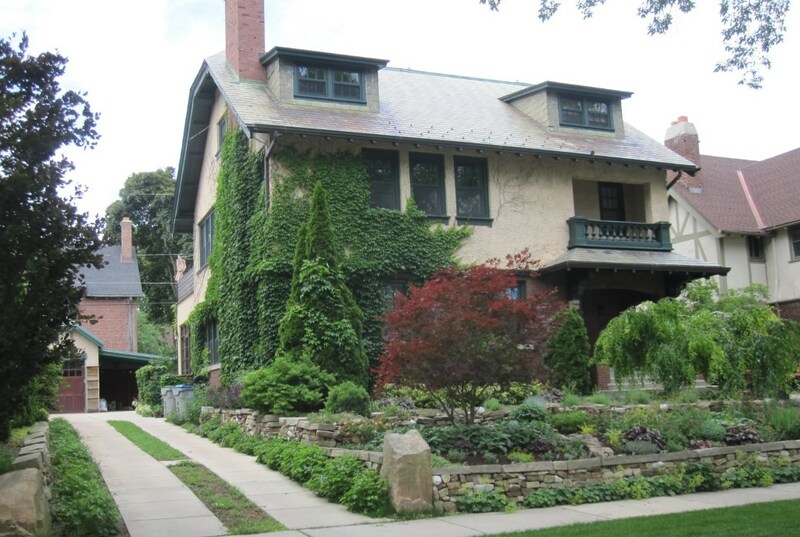 Among the gardens on display will be that of Lincoln Fowler and his wife Lilith Fowler, who live in a residence on N. Marietta Ave. designed in 1911 by the fabled firm of Ferry & Clas. The architects were proponents of the Beaux Arts school; their 1898 Milwaukee Public Library Central Branch remains the monument to the style. They found a ready clientele in such Germans as Gustave Pabst, whose 1906 home on the lake is also designed along Classical lines. (See House Confidential: The Fabulous Gustave Pabst Mansion, August 2016.) Their 1892 Pabst Mansion, built for Gustave’s dad, Captain Fred Pabst, is completely off the charts. But here, on this quiet East Side street, we find the partners working from a simpler template, with a 4,027- square-foot, Craftsman-style home that is comparatively modest in its scale, ambitions and detailing. A little brick below, some stucco above, a couple of dormers, a recessed porch and a sloped bungalow roof do the trick. This is not to say that A. C. Clas and G. B. Ferry anticipated the Bauhaus School, or were pioneers of minimalism, but the home is subdued by their standards. It was constructed at a cost of $12,000 for Percy Luebben (1863-1942) and his wife Frieda Aschermann Luebben (1871-1947). 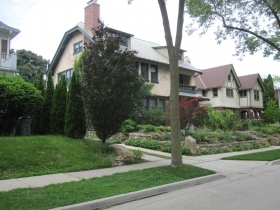 That is only 5 percent of what the Frederick Pabst mansion cost twenty years before, but was still on the upper range of Milwaukee home prices for the pre-World War I era. Twelve grand still got you something back then. According to the assessor, one room had an Arizona flagstone floor, recessed pictures in a Tennessee stone wall, a wood-burning fireplace and a bar. And it’s in the basement! The home is otherwise outfitted with a sunroom with a quarry tile floor, “beautiful woodwork,” five bedrooms, four baths, one half-bath and two fireplaces in addition to the one in the cellar. This was a rather nice pad for the Leubbens and their 17-year old son Gerald (1894-1967). The elder Luebben was of German background, which made him part of the majority class of Milwaukee at the time. He was also native-born, which put him in the minority. Carbolineum was founded on March 6th, 1889 and is still in business today at 6683 N. 40th St., Milwaukee. It is owned by Fred Leypoldt III, whose grandfather was the president of the firms with which Percy Luebben was affiliated. The Luebbens apparently lived a quiet life in this home, with Mrs. Luebben remaining until her death in 1947. Apparently she was quite happy with the home as it was, but by 1949 we see a shift from maid-operated homes to owner-operated ones. The kitchen finally got a dishwasher and a garbage disposal. A gas burner replaced the previous furnace in 1951. In 1956 Carl E. Wooliever, an executive with the A.O. Smith Corporation, owned the place. He built a garage and a carport on the property, accessible by the drive to the south of the home. That set him back $800. In May, 1962 the home was listed for sale for $36,500, a steep decline from the $45,000 it brought in 1959. “Built-in intercoms!” the advertisement exulted. Yet where were the servants to answer the summons? By November, 1962 the situation had turned dire and the home’s price was knocked down to $34,500. “Must Sell. Owner in California!,” the real estate agent lamented. Still no takers until 1963 when it was purchased for $30,000 by John L. Blum (1917-1995), a UWM Professor of Botany. In 1967 the busybody assessor paid a call to the house and checked out the intercom system that was such a selling point in 1962. “Only two rooms working,” he lamented. In June 2001, the long-neglected kitchen got its first update in years when new owner Chris Gawart paid $7,000 for a new kitchen. 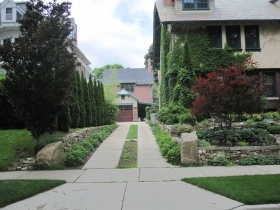 Finally, in May, 2005, the home was purchased for $610,000 by Lincoln and Lilith Fowler, the current occupants, who greatly expanded the garden, and made many other improvements to their old house. This property announces itself as a prime candidate for a garden tour as soon as it comes into view. 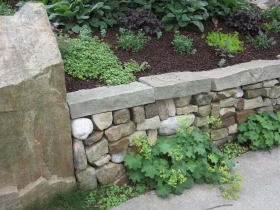 The garden is set off from the sidewalk by a low dry-set stone wall with mighty, angular quoins. It ain’t going anywhere, unlike some of the far-less substantial retaining walls (made of concrete blocks!) that are evident in the vicinity. Above the wall, on a gentle slope, lies a glacier’s worth of rocks that retard erosion and help with the apparent good drainage of the garden, as well as provide a lovely setting for a profusion of perennials. Dotted throughout are clumps of native plants like Maple Leaved Alum Root, the color of which matches the Japanese Maple at the corner of the lot. 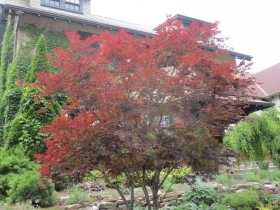 Specimen acer palmatum plantings might be a cliche, yet a lovely cliche nonetheless, and we certainly don’t want to return to the Schwedler Maple craze of the mid-sixties, do we? The garden. Photo by Michael Horne. In addition to Prairie plants, such as the Cranesbill geranium that lines the driveway, the lot contains more traditional and formal landscape plants such as iris and hosta that would have been familiar to the Luebbens. The home sits with a certain dignity above this display, and sports a vertical garden of its own in the form of a vine of a vitis vinifera species that has been on the attack probably since Luebbens day, which was the last time such an element was considered an essential of domestic landscape architecture. It has grown nearly to the slate roof of the home, and has covered portions of the lower floor’s windows, which is considered by some part of the charm. However, the chlorophyll-fueled beast has had the temerity to intrude itself into the affairs of an innocent Arbor Vitae that was simply minding its business as a foundation planting several feet away. The vine has now worked its way through the evergreen, and is on its relentless drive to attack the Japanese Maple next. 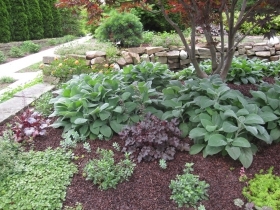 See for yourself on the garden tour, Sunday, June 25th, where the back yard will also be open to inspection. In addition to the garden improvements, the owners tore down the old garage, and erected a new one in 2005 that is most attractive. Further improvements seem to be never ending within and without the property, including a chicken coop in the back yard. And old Percy Luebben would be happy to know that all wood surfaces of the home are in fine condition. We’re also guessing there’s plenty of coffee and coffee paraphernalia, given the current owners’s occupation. Lincoln Fowler currently serves on the East Side Architectural Review Board, and once served on the Redevelopment Authority of the City of Milwaukee. His stores have made considerable use of reclaimed materials and have enlivened previously derelict structures like the Colectivo Lakefront, located in an old pumping station. The Colectivo Foundry, in Walker’s Point, is located a block away from Percy Luebben’s old office. Lilith Fowler is the Executive Director of the Harbor District, Inc., which she joined after a ten-year hiatus as part-time gardener and full-time mom. She is tasked with bringing new life to the old harbor district and surrounding areas. She has experience, having served as the first director of the Menomonee Valley Partners. She is the treasurer of the Milwaukee Riverkeepers and is on the finance committee of the ACLU. North Point Light House, 2650 N. Wahl Ave.
Urban Ecology Center, 1500 E. Park Pl. Downer True Value Hardware, 2629 N. Downer Ave.
Assessment: Land: 8,400 square foot lot is valued at $100,900 ($12.01/sq. 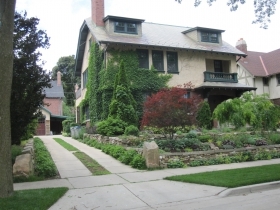 ft.); Improvements: $664,300; Total assessed valuation: $765,200. Garbage Collection Route and Schedule: In June it’s every Friday, in July and August it’s every Monday, and starting September it’s every Tuesday until the end of the year. Polling Location: St Mark’s Episcopal Church at 2618 N Hackett Ave. Walk Score: 55 out of 100 – Somewhat walkable, some errands can be done by foot. City average walk score is 62 out of 100. Transit Score: 58 out of 100 – Good transit, many nearby public transportation options. City average transit score is 49 out of 100. How Milwaukee is it? The home is just 3.3 miles from City Hall. Nice use of “quoins,” Michael. I had to look that one up! All I knew when I saw them at Halquist stone’s yard was we had to have them!